In the far south of Spain, in the region of Andalucía, you can find Alfonso Lopez De Carrizosa. Don Alfonso, for friends and family. Norwegians know him from the family-oriented reality show «The Big Leap» that captivated viewers in 2016. Today, his traditional Doma Vaquera outfit is substituted with a colorful piquet, a wide smile and a unique contact with two- and four legged creatures. Alfonso as we’re used to see him: with an unshakable, concentrated expression, in the middle of a flying change on Maestro. Maestro means teacher. Alfonso is a very distinctive, influential one. Alfonso’s phone is constantly going off. He’s just as dependant on it as it is a constant source for annoyance. “Stupid phone” he shouts as he holds it far from his ear trying to turn on the speaker. The horse Nadador jumps slightly when a loud male voice comes streaming from the phone. “Eeeejjjhh” Alfonso murmurs to the horse in a familiar and low-pitched voice. He adjusts his body slightly to the left, and Nadador is back on his track and fully focused. Alfonso finishes quickly, hangs up, or probably doesn’t, and sends the lit phone down his pocket. «Ok, are you guys ready for some canter! » Alfonso shouts out while we are trying to keep up. 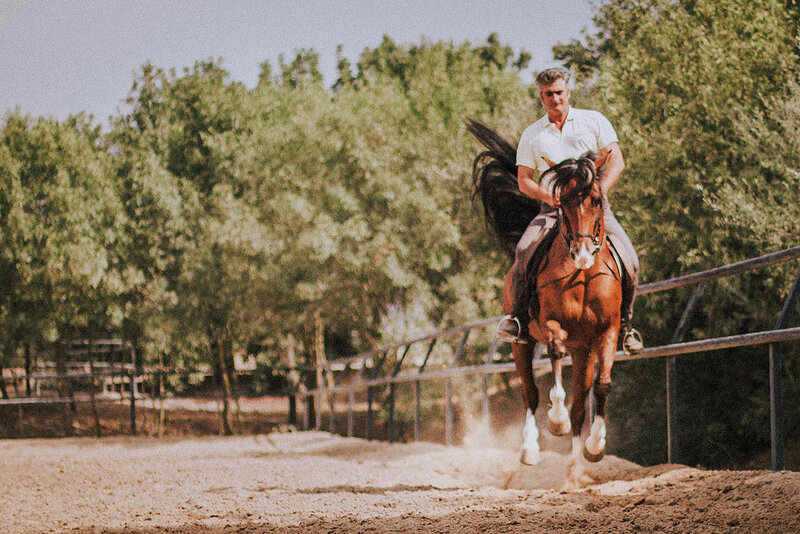 He’s already at full speed over the dry, yellow plains surrounding AlcantarA Ecuestre, the beautiful family ranch/farm he owns and operate together with his wife Rocio. We are in Jerez, Andalucía, the horse capital of Spain. 09.00 / Alfonso has been at it for hours already. The German Westfaler-mare Trappa is ready for the day’s first lesson. Alfonso got her from a customer that couldn’t pay him back with money. 10.00 / The second lesson of the day. Alfonso leans against the fence framing the dressage arena, observing Nadador under another rider than himself. He has been a “very naughty horse” recently. Now, Alfonso is trying to figure him out before letting his customers ride him again. Wearing a yellow piquet and muddy boots it’s little that reminds us of the strict Alfonso we know from TV. His walk is casual, his arms in constant movement. Always busy, energic and happy. «Ok, now I have to ride this horse a bit before the Yoga-ladies are coming.” He calls all horses for “him” regardless of gender and he has memorized all the Norwegian gaits in our native language so his Norwegian guests, and there are a few of us, understands his instructions. It’s not a problem hearing what Alfonso says out on the track. The decibel is turned up and his love for rapid changes are evident. After all, he is a Spanish champion in vaquera. His body language is just as clear as his own riding style. The horses, about twenty-five in total, all understands when Alfonso gives instructions. And so does the riders. For a reserved Norwegian it can almost be perceived as irritation when you are learning from Don Alfonso in the arena. But it’s not. Alfonso is just incredibly passionate. And he will never give up on you. «I have all evening. Now, canter and do it right!» Alfonso sees every little movement in both rider and horse – and he has decades of experience to share. The Norwegian yoga group has a varied level of experience when it comes to horses. Some are quite experienced, others have never touched a horse before. Alfonso meets them all with the same respect and uses humor to calm their nerves. «Get up on this crazy horse!» he instructs the blonde Norwegian first time-ride. He laughs with his whole body when seeing her reaction. In the arena he gives everyone some one-on-one time to make them feel comfortable. And he sees the level of each rider immediately. «Everyone do a circle! And now - canter. Right leg back. Do it now!” The blonde yoga enthusiast, on her first horseback ever, is now cantering controlled together with her friends, only minutes after meeting Alfonso and his horses. «Very good, this is the way!» shouts Alfonso. Circling around in the arena are five riders in total control, looking like they have been riding for years. 12.00 / Nadador, “swimmer” in English, gets a good shower in the more than thirty degree heat. Dark, heavy clouds hang over the fields surrounding the stable. “This is all my family’s land”, Alfonso usually says when riding toward familiar horizons in front of the horse’s pointed ears. After an intense hour Alfonso removes all saddles and then showers two and two horses at the same time. He moves them around in the outdoor shower by some easy whistling sounds. The horses await happily in the courtyard without any ropes. They enjoy their freedom and knows how to behave. Inside the stables you can see that the horses know when Alfonso is close. In the pack, Alfonso is the natural leader. He has an unaffected style and if you ask him who’s his favourite, he can never pick just one. He knows them too well to start comparing. They are praised when they do good and all horses are working hard when they come out to perform in the arena. 14.00 / Siesta. Not necessarily a Spanish phenomenon Alfonso really follows, but Alcantara always falls quiet when the day is at it’s warmest. When he first sits down, he turns on the TV, but goes back to meet another group of riding tourists after just a small hour of rest. At the dinner table later that night, he admits to having fallen asleep in front of the news. When Alfonso finds time to eat or drink during his busy day is a mystery. But when yo'u’re done with your lesson, he is quick to offer a local beer or some delicious ham. Accompanied by the vegetables of the season from their own vegetable garden. So as a guest, you never go hungry or thirsty for long. In a day, Alfonso disappears maybe five times. Perhaps that’s when he finds a minute to refuel for some energy. But just when you recognize he’s gone, he turns up again on an ATV, in his pickup or on a horse you never knew when he found the time to saddle up. 16.00 / Some of the yoga ladies in newly purchased breeches want to explore the landscape around the farm on horseback. Alfonso mounts the six year old Lusitano-stallion Gruyo. 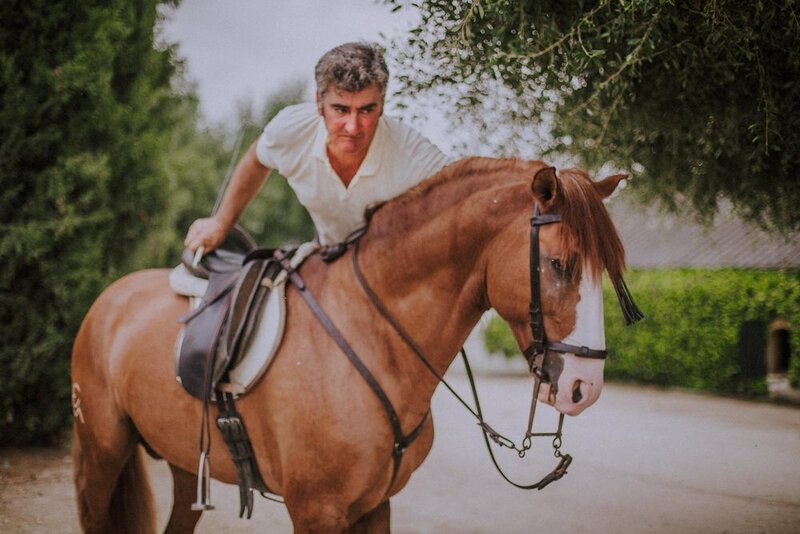 “Let’s go for a hack”, he says, ducking under the olive tree before leading them out on the riding trails between cotton fields and pastures where both youngsters and Alfonso’s most faithful horses dozes under the Spanish sun. The day goes both fast and slow at Alcantara. Nothing ever feels hasty or stressed. You get the real feeling of freedom while countering the Andalucían plains with a cheerful Alfonso calling everybody «totally crazy!» When you the sun is going down and you are heading back to the stable, Alfonso makes a quick call to Rocio. She then finishes preparing the dinner for you and the family. All ingredients from their own farm or the local community. The dinner is shared outside on the terrace, and Alfonso is happy to share stories about his family, the horses, his hunting trips to Norway or his love for Norwegian chocolate. The horses are one thing, the authentic vibe of Jerez another. But the most unique thing about this place is Alfonso. Hectic, determined, calm, friendly and funny Alfonso. Leaving Alcantara and you will forever remember Don Alfonso because of his personality. His way of making every guest, and horse, feel special, respected and challenged. And of course, some “totally crazy” counters on the most amazing horses you’ll ever meet! 20.00 / Young Solidaria is last to go before dinner. Alfonso is schooling her for her Norwegian owner who fell so hard fo the place and the horsed that she bought a Spanish foal and handed Alfonso the reins and the task of educating her. AlcantarA is not a place listed by traditional tour operators. If you want to experience Alfonso and his Spanish horses, please contact post@cavalierno.com and we will refer you to AlcantarA Ecuestre.